The dramatic view across Clew Bay from the top of the Reek, taken from the tumbled cashel walls. The circular green indentations in the foreground are found all around the summit. They may be the remains of huts where ancient pilgrims camped. 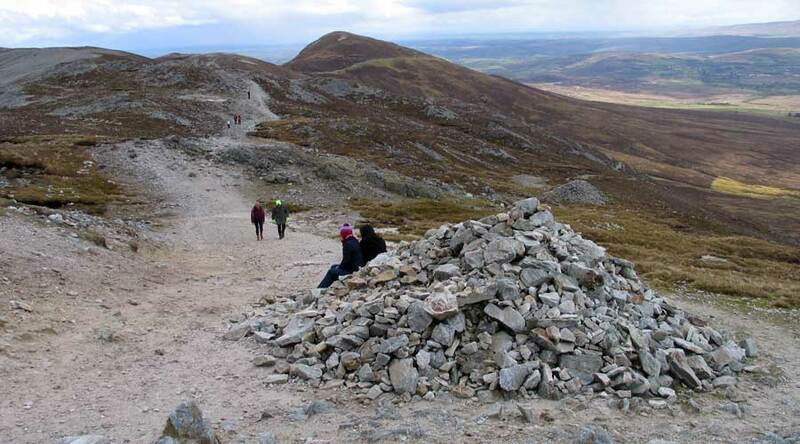 There is an ancient pilgrimage route running from Ballintober Abbey to the summit of Croagh Patrick. It probably extends back east to Rathcroghan, the palace of Queen Maeve, the Iron Age ruler of Connaught. 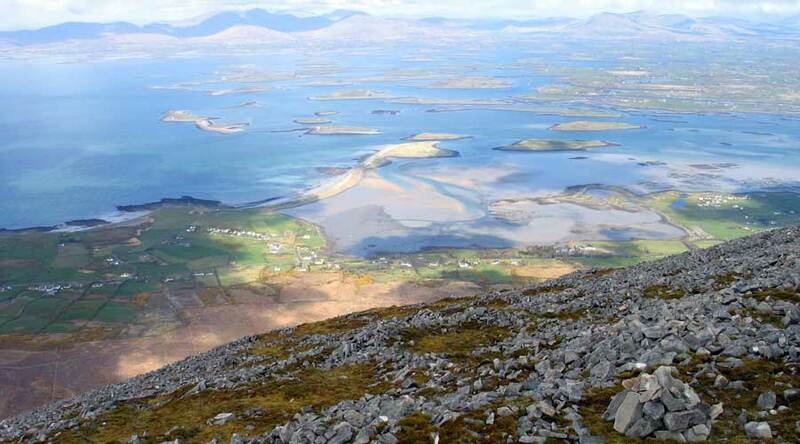 Westport researcher Gerry Bracken was cataloging monuments in the Westport area when he came across an unusual site, known as St Patrick's Chair, or the Boheh Stone which is located on the pilgrimage trail south east of Croagh Patrick. The sequence of photos below was taken in 2000. The Rolling Sun of Boheh, 22 April 2000. As the sun sets, it appears to roll down the north slope of Croagh Patrick on 2 days in the year. The spectacular event takes about 20 minutes. Four more stages of the 'roll' are shown below. This monument is covered in cup and ring marks, and turns out to be the only known example in Connaught, as well as one of the finest examples in Ireland. Gerry discovered that on two days in the year, the setting sun, when viewed from this spot, touches the summit of the Mountain, then proceeds to 'roll' down the northern slope. The angle of the Mountain's side matches the declination (setting angle) of the sun at this time and place. The extraordinary phenomenon of the rolling sun down the slope of Croagh Patrick by Ken Williams. The dates are April 18 and August 24, dates which along with the winter solstice divide the year into three. The view to Boheh (nearest hill, top right) from the cairn on the 'saddle' of Croagh Patrick.